I am positively thrilled with the lovely people who are taking advantage of my mega clearance sale on Etsy! Thank you! Thank you! Thank you! When I decided to close my business, I had so much inventory that I seriously wondered if it would ever be gone. I thought I would be selling aprons for eternity. Alas, many local customers have come to my rescue and stocked up on holiday gifts. Smart cookies, my customers. But the real star was my old Spanish tutor, who goes on a mission every spring to Nairobi. A few years ago, she purchased a few of my aprons to give to the women there, and apparently, they loved them. The next year, those 12 women met her at the airport, wearing my aprons. That just warmed my heart beyond belief. They were actually disappointed that she didn't bring more. Last week, she came over and bought out my stock of half hostess aprons to send to them. I'm just beside myself, and made her promise to send a picture of them all wearing aprons! Wouldn't that be an amazing sight? Picture 120 women wearing your creation. I'm giddy just thinking about it. 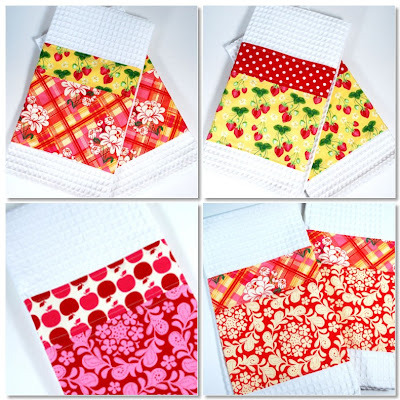 Well, the sale continues - this morning I marked down the dishtowels to $14.00 for a set of two. All the quantities are listed, so you can buy as many sets as I have available. They're darling, really, and super absorbent. Available here - while supplies last. I can say that now. Content & images © Carrie Sommer 2010. Simple theme. Powered by Blogger.